Too many businesses are still obsessed by their competitors and fail to put enough emphasis on what their customer wants, according to Pandora Media’s managing director, Jane Huxley. Speaking on the subject of defining customer journeys at the Chief Digital Officer Forum in Sydney, Huxley pointed to three ingredients her organisation uses to improve customer experiences and engagement. The first is watching the customer “like a hawk”. “You need to know every single thing about the customer, then demonstrate that you are listening by refining your offer every day,” she said. “On top of that, you have to watch the market and broader, general trends. The business we are in today, for example, is a data business led by mobile and constant disruption. Huxley said one of the first things she does each today is log into Pandora’s customer service desk to see what is being said about its products and services. Pandora also taps into a wealth of customer data to improve its product set, using login as a unique identifier, Huxley continued. Pandora’s product offering is built off the back of its Music Genome Project, which defines music by 450 different taxonomies and then uses these to provide personalised music streaming to customers. On top of this, Pandora further reshuffle what’s delivered by allowing consumer to rate songs with a ‘thumbs up’ or ‘thumbs down’. “We have 55 billion pieces of data just from the thumbs up or down,” Huxley said. “Human curation, plus stirring our algorithms, helps us continually up the game on the product and personalisation. “The customer journey is all about you telling me about who you are, where you are, what you like and who you know, but it’s also about constantly feeding back to you that we have listened and are responding to what you’re saying. 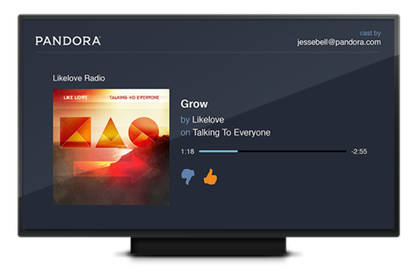 Customers aren’t just the listeners, they’re also advertisers and music makers, and Huxley said Pandora provides a range of data-driven services to these stakeholders to add value. For example, Pandora recently opened up its Genome Project to an ‘Artist Marketing Platform’, where music makers can claim their identity and gain access to data insights on who’s listening, where they’re located, and so on. “This could help artists decide which states to tour in, which songs to play, which bands to tour with, and importantly, allows them to directly connect to fans of their music,” Huxley said. Alongside customer data, Huxley identified two external market trends influencing Pandora’s business model: The shift to mobile; and the move away from Web to access on a mobile to mobile apps. “There are only 10-12 apps out there owned by independent publishers that own the customers when they are inside the app,” Huxley commented. “Each is a data collection business and Pandora is one of those. You need to partner to find those people.